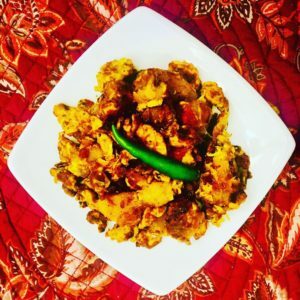 Kappa Mutta–Scrambled eggs with spiced yuca – Welcome to Creative Rajni! Kappamutta is the malayalam name of this dish. Malayalam is the language of Kerala. ‘Kappa’ means Yuca and ‘Mutta’ means egg. Hence this dish is Scrambled eggs with spiced Yuca. It’s a traditional dish that you’ll find in the roadside eateries in Kerala. I love the different textures in this dish. The soft scrambled eggs along with the spiced and crispy yuca is heavenly. 1.Take a deep pan for making the gravy. Heat the pan with the coconut oil and once hot add in cumin seeds and curry leaves. 2. Now add in the red onions and stir well until it turns light golden brown for about 10-15 minutes. 3. Add in the curry leaves, coriander powder,cumin powder, tumeric powder, salt and pepper and stir well for 30 seconds. 4. Add in the tomatoes and stir until well blended. Now add in 1 cup of water and bring it to a boil. The gravy is ready. Keep this aside. 5. In another pan, add in coconut oil and cumin seeds. After 30 seconds, add in eggs and cook it until firm. Keep the eggs to one side of the pan. On the other side of the pan pour a little coconut oil and toast the yuca so that it becomes crispy. Now mix the eggs with the yuca and add a ladle of the gravy as well and combine gently. 6. Add fresh coriander leaves chopped fine and its ready.